Lindsay Turner is the author of Songs & Ballads (Prelude, 2018). 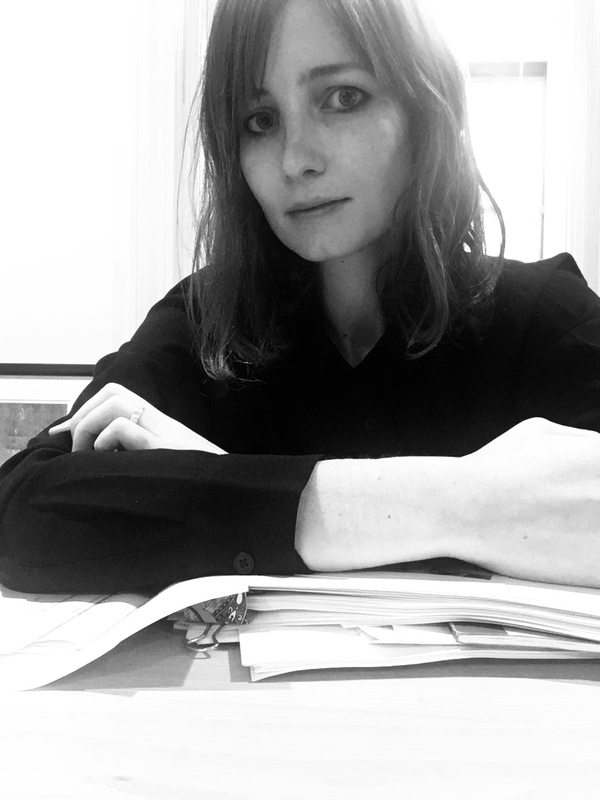 Her translations from the French include Ryoko Sekiguchi's adagio ma non troppo (Les Figues, 2018), and Stéphane Bouquet's The Next Loves (Nightboat, forthcoming 2019). She lives in Greenville, South Carolina, where she teaches English and Creative Writing at Furman University starting in the fall of 2018. Songs & Ballads felt really different from anything I’d written before. The biggest difference between older poems and the poems in Songs & Ballads is in form: around the summer of 2014 I started playing around with quatrains and off-rhymes and crazy repeating patterns I made up for some of the poems, and I couldn’t stop. (I thought this was over when I finished the book, but I don’t think it’s out of my system yet.) I don’t know if my first book has changed my life. I feel more certain of myself as a poet—even if I never write anything else starting tomorrow, I will have written a book, and that feels solid and good. Also I feel like the slate has been cleared, or the thicket of work I had to write before writing the book has been cleared, and I can start over for the next one. I started writing poetry as a kid growing up in Tennessee before I knew that people actually wrote poetry, and before I read any poetry—so it’s hard for me to say how I ended up with poetry. I took a poetry workshop my first year in college, and everything absolutely clicked: I realized I wasn’t the only person who wanted to read and write in this bizarre way. I’ve thought about writing fiction or non-fiction, and even tried, but I find it hard to sustain longer projects (even longer poems)—and impossible to believe in plot. Sometimes a poem takes a while to build up and then comes out in a rush. Sometimes it just comes out in a rush. Sometimes it’s a struggle and a lot of tinkering and deleting and re-doing, although these are the poems I often end up throwing out. I’m always taking notes, but they don’t always make it into poems. This also varies for me. Sometimes a poem begins from a line or two, or sometimes an image. Sometimes—as with Songs & Ballads—it begins with a form or a shape. For Songs & Ballads, I saw the shapes of the poems as boxes to be filled in before I wrote some of them. As far as book structure: most of the time I half-close my eyes and cringe and try not to think about it until I’ve got about a book’s worth of material. I still don’t think I know how to write a whole book. My work—especially the work in Songs & Ballads—is meant to be read out loud, and I love reading it. Plus I can never tell if a poem is finished until I read it out loud in front of someone who’s listening. I write with the theoretical concerns I live with: what in the world is happening right now? Has it always been happening? How do the things I do and see and feel every day, in a medium-sized upstate South Carolina town, have something to do with global inequality, massive expulsions of populations from the places they live, climate change and attendant catastrophe, police brutality, the violence of gender at different levels, structural racism? How and where to end that list? To echo you, what are the current questions, and how do you live and write while asking them? I don’t have many answers. The writer definitely has a role in larger culture—I mean, the writer is such a constitutive part of larger culture. But I don’t think writers are very good at saying what it is, much less what it should be. I guess, just: keep writing. I haven’t done much work with outside editors for my poems. I have a few friends who are wonderful at giving suggestions. For prose and criticism, working with outside editors has been amazing: I think good, thoughtful, thorough editing can be a remarkable act of intellectual generosity. My first poetry teacher insisted that a poem be rooted in the real, concrete world. When things are going terribly wrong in a poem, I go back to that. Translating is relatively new for me: I was always intrigued by the idea of doing it, but I never thought I could. When I first started translating, it was because I could hear certain texts in English as I read them in French. It turns out that I really love translating, especially poetry, because it sends me back to the part of writing that’s a fundamental, material engagement with words and sounds. It reminds me that writing is a material process. It’s a little addictive, because at the end of the workday you’ve got a poem, and you feel like you wrote it! But you didn’t have to have any of the ideas behind it. Sometimes I worry that translating’s just a very productive form of procrastination. But that’s not fair, because I do think it’s crucial that the writers I’m working with are available in English, and I’m excited for an Anglophone audience to encounter them. Besides, I can’t write good poems as often as I’d like to, so translating probably saves me from churning out a bunch of really awful work. It’s terrible: I don’t have a writing routine or even a typical day. For about two weeks a year I can’t sleep and write from 3-5 in the morning. That’s great but can’t last. More normally, I have to get things like emails and errands done in the morning. I like to go for a walk or run or something in the middle of the day. Afternoons are my best writing time, at least for prose things and translation, and then evenings and nights are reading or poems. But this changes when I’m teaching or when I’m really into what I’m doing (or under pressure to finish). And when I start writing a poem I can usually work on it wherever, whenever. When I’m writing poems is the only time I ever lose track of time—like, the whole morning is gone and all I’ve done is fix a line. All I know how to do is take the dog for a walk, and wait it out. Cut grass and hot parking lot—summer in the American southeast. I used to think all you had to do to be a poet was read a lot of “great” books, but now I think that’s wrong. This is a relief, because looking at things that are not books and doing things that are not reading have secretly always been more generative for me than reading (although I read a lot, and like it). It’s hard for me to write without lots to look at: I love the mountains where I grew up, which are the same mountains I live near now, and I’m grateful to live in a neighborhood with gorgeous old trees and some hawks and owls. I wrote a lot of Songs & Ballads living on the west coast of Ireland, and it’s the only time I’ve had the ocean there to write about. Movies help when my eyes get too bored. Poets like Alice Notley and Bernadette Mayer have been so important for me lately: they’re models of writing from the center of real, worried, messy life—not museum life or library life or constant pared-down heightened-beauty life. I want to travel to all the places I haven’t been, perfectly curate a minimalist closet of clothes I totally love, and write the next book. Travel agent (budget travel for creative types). Translator of wine labels. Geographer. I liked waiting tables but I wasn’t very good at it. I often think I should be doing something else. But I’m miserable when I’m not writing, and there’s probably nothing I could do that would fix that. Chelsea Minnis’s Poemland. Also Sister Love: The Letters of Audre Lorde and Pat Parker 1974-1989. A new documentary by Wang Bing called Madame Fang. I like working on bunches of things at once, so that when something stalls I can pick up something else. Right now I’m finishing up two translation projects (Stéphane Bouquet’s Vie Commune, a wonderful multi-genre book [that needs a home], and a book of philosophy, Souleymane Bachir Diagne’s Postcolonial Bergson, out soon with Fordham UP) and digging into a third (Liliane Giraudon’s Love Is Colder Than the Lake, co-translating with Sarah Riggs). I’m picking at a book of prose poems, Essays on Waiting, which is basically finished. I’m reading for and thinking about an essay I want to write on Barbara Johnson’s essay “Apostrophe, Animation, and Abortion” and race and reproductive justice. I’m making up syllabi for the workshops I’m teaching in the fall. My partner, Walt Hunter, and I are writing a chapbook called Wasted Empty Space. I’m working on poems for a next poetry collection, which might or might not be called Accomplice.